Wednesday is the weekday that I most enjoy cooking. It’s hump-day, the weekend is in sight, and I always feel like rewarding myself with a nice meal. This is one of my staple dishes – it’s one that I can make in a hurry by using frozen vegetables and beef substitutes, or from scratch with fresh ingredients and tempeh or tofu. 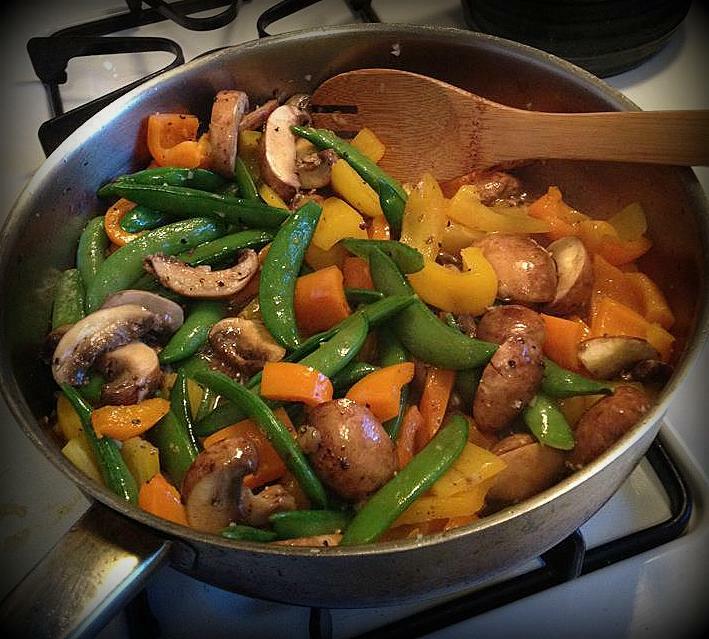 Stir-Fry, to me, is an ‘anything goes’ recipe – you are limited only by your imagination. Most people have their own stir-fry technique. Personally, I think it’s very hard to achieve the authentic flavor that comes from the high heat and even distribution without using a real wok. However, since I do not own a wok at the moment, I use a regular old stainless steel saute pan, and it works fine. Ideally, you should stir-fry all the ingredients in one pan so that all the flavors blend. 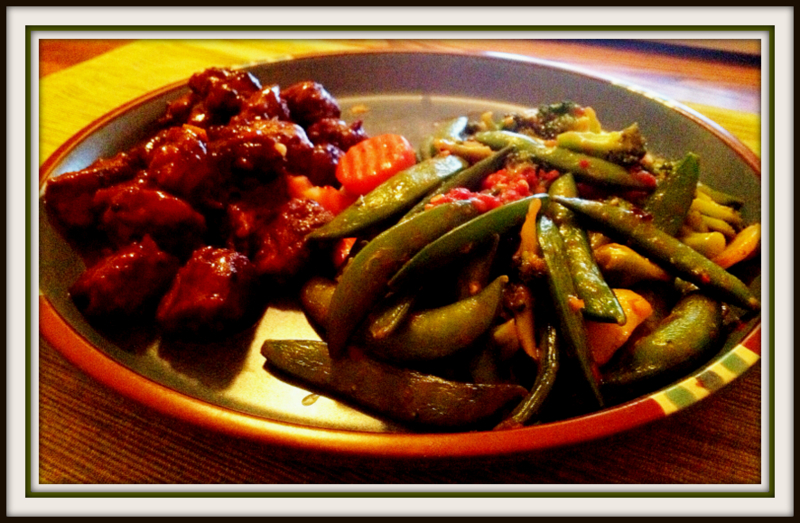 However, I occasionally cook the mock-meat separately and serve it alongside the vegetables, as pictured above. You can also add brown rice or soba noodles to this recipe to make it more filling! Defrost Gardein beefless tips slightly by microwaving them for 1 minute (I find that throwing them into the pan frozen makes them turn out less crispy and less porous to the flavors in the dish). If using frozen snow peas, defrost in the microwave for 1 minute or according to directions on package. Preheat wok or pan slightly over medium heat. Add 1 tbs oil to cover the bottom of the pan. Add minced garlic and start to brown, about 2-3 minutes. Add beefless tips, stirring occasionally to prevent garlic from burning. If they stick, add a little bit of vegetable stock or water. Add peppers, stir-frying for about 3 minutes, until slightly fork tender. Add remainder of canola oil, snow peas and mushrooms, stir-frying for about 3 -4 minutes. I like a more crunchy stir-fry, but if you prefer more tender vegetables, you can continue to stir-fry them until they reach your desired consistency. If vegetables are too dry, add a little water or vegetable stock. Stir together corn starch and water until mixed thoroughly. Add 1/2 tsp soy sauce. Add mixture to stir-fry and mix until liquid thickens. Add ginger, remainder of soy sauce and chili sauce, and stir until combined well.